Large & Old Files streamlines one of the most complex and painful cleanup tasks — a review of files. 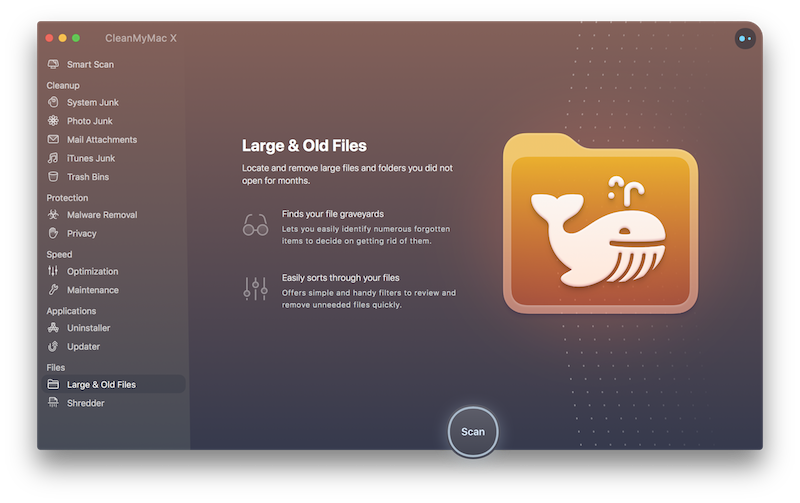 It finds the heaviest files on both your Mac and external drives and groups them by kind, size, and access date. So, instead of looking through every folder, you only need to check a list of properly arranged files. CleanMyMac scans your Mac or connected devices and filters out files occupying at least 50MB of disk space. None of them are selected for removal automatically, because all items in this module may contain useful data. Also, CleanMyMac doesn’t give any advice in this module. Choose a location: Navigate to the Large & Old Files module and choose a drive or external device you want to tidy up (if an external device is connected, you’ll see it in a list of available locations). Scan: Navigate to the Large & Old Files module and click Scan. To review an item in Finder, control-click it and choose Reveal in Finder. Remove Immediately: A default option that removes files quickly, in an ordinary way. Remove Securely: Deletes items so that they cannot be recovered with any special tools. This type of removal takes more time, but all data gets rewritten, which leaves no chance to recover. Done with your largest files. If you need to remove only a couple of certain files or folders, drop them onto CleanMyMac and use Shredder. It'll also give you regular and secure removal options.